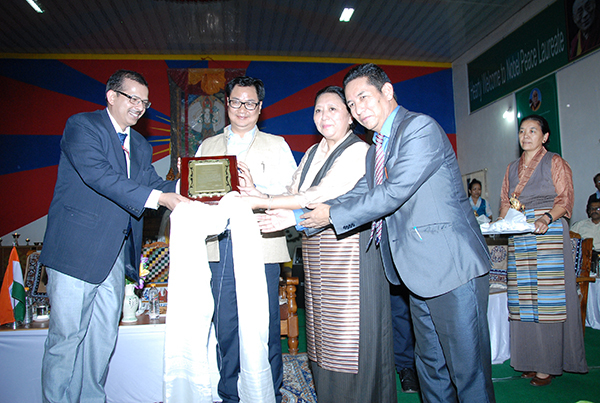 (TibetanReview.net, Mar26, 2015) – India’s Minister of State for Home Affairs, Mr Kiren Rijiju, on Mar 23 visited the Tibetan settlement at Bylakuppe, Karnataka state, possibly becoming the first union minister to do so. He said he considered it his duty to help Tibetans as they were honored guests of India. He also promised to ensure that all Tibetans were able to live a peaceful life in India, with access to various government welfare schemes and subsidies, referring to the Tibetan Rehabilitation Policy that his ministry issued last year. Addressing a large Tibetan public gathering, Mr Rijiju thanked the government and people of Karnataka for their generosity and hospitality towards Tibetans living in the state. He also called on the Tibetan people to follow the path shown by the Dalai Lama whom he called the most loved personality on earth. Mr Rijiju was accompanied by Mr KK Pathak, Joint Secretary at the Ministry of Home Affairs, Government of India, and Ms Gyari Dolma, the Central Tibetan Administration’s minister for the Department of Home.